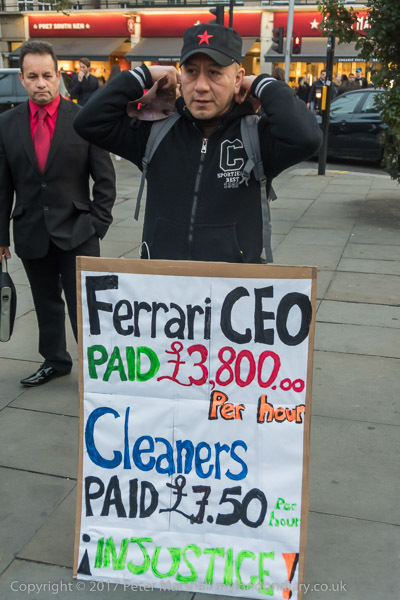 As darkness fell, another Halloween-themed employment-related protest was taking place, this time in one of the richest neighbourhoods of London, South Kensington, and involving some of the poorest workers in the capital, the two cleaners who have kept the Ferrari and Maserati showrooms of H R Owen spotless on the legal minimum wage for the last 12 years. 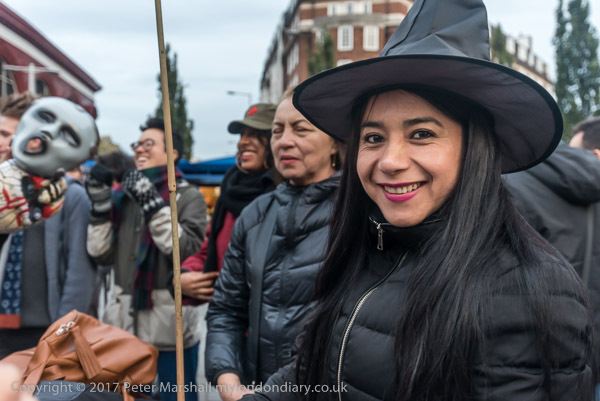 Both Angelica (below) and Freddy (above) are Spanish speaking migrant workers and members of the United Voices of the World trade union, whose members and friends had come to support the protest, meeting outside South Kensington Station. 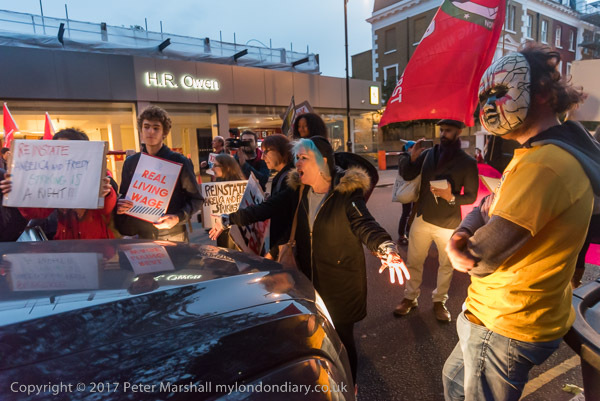 The posters they are holding sum up the issue, though they are not asking for parity with the bosses, simply for enough to live on, the London Living Wage. Not a fortune, but over 20% more than they were getting paid. As is so often the case, the owners of the showrooms, H R Owen, the worlds largest luxury car dealer, say that it is not their responsibility. They put the cleaning out to tender and give it to the lowest bidder, in this case Templewood Cleaning Services Limited, who make their bid the cheapest by keeping wages and conditions to the minimum and cutting corners in various ways. While reputable companies would feel bound to pay a decent rate, provide proper sick pay, pensions and holidays in excess of the legal minimum, provide proper safety equipment, materials and training and give workers the time needed to do the job to a good standard, cleaning contractors generally have no such scruples. The UVW, as legally required, held a strike ballot to support the workers claim for a Living Wage after this had been turned down. Unsurprisingly it got a 100% support in a vote with 100% turnout. The employer’s response to the workers’ demand was to suspend them. 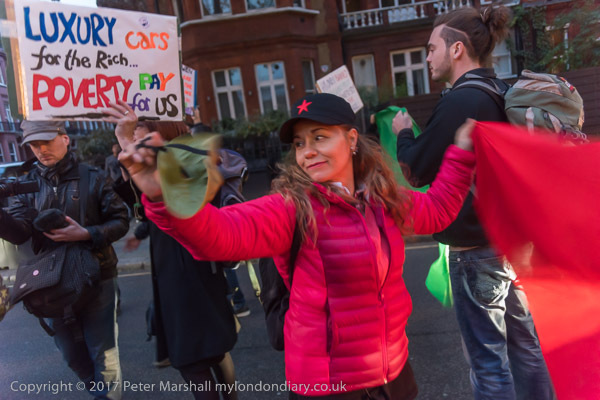 The day before this protest at the end of a a five hour grievance and disciplinary hearing they gave the workers a choice; promise not to strike at Ferrari and accept your poverty wage, or find work elsewhere. 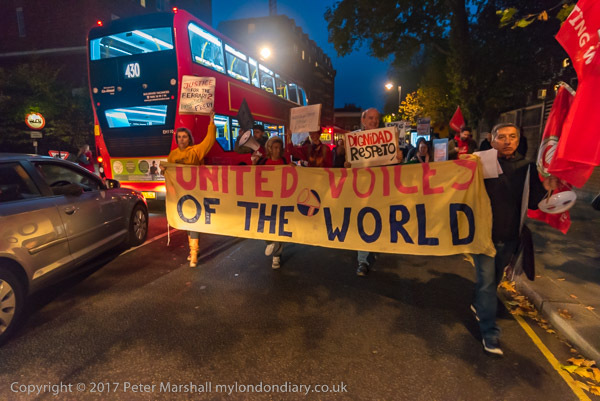 This had been meant to be an unannounced protest, but the lengthy gathering outside the station and the rather noisy march along the road gave the showroom management plenty of notice, and when the protesters arrived the doors had already been locked, and the protest took place on the street outside. It blocked the road, causing considerable disruption with traffic including buses having to be diverted around nearby streets, and I’m sure greatly annoyed some of the wealthy neighbours. Eventually after 30 minutes of protest the police arrived and tried to talk to the protesters, without a great deal of success. They were told why the protest was taking place and that the protesters would move when they felt they had made enough of a protest. 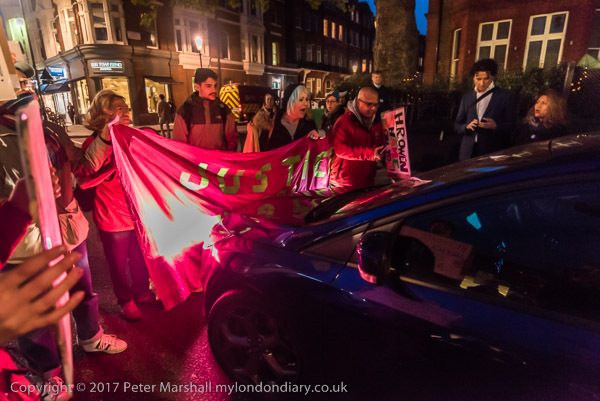 They did leave soon afterwards, but only because one of those supporting the protest, the president of the IWGB trade union persuaded the protesters to march to protest at another location where cleaners in the IWGB are under threat. I didn’t go with them as I had promised to be elsewhere. This story did have a happy ending. This protest achieved some publicity in the newspapers and TV, and perhaps those wealthy residents in the area also put on some pressure (quite a few people passing the protest had actually stopped to find out why the protest was taking place and expressed shock at the low pay of the cleaners) but for whatever reason the next protest planned for a week or two later was cancelled at short notice as the dispute had been settled with the cleaners back at work and on the London Living Wage. This entry was posted on Friday, April 6th, 2018 at 09:22 am and is filed under My Own Work, Political Issues. You can follow any responses to this entry through the RSS 2.0 feed. You can leave a response, or trackback from your own site.